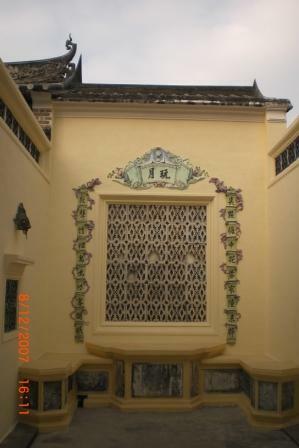 Hong Kong Tai Fu Tai Museum was the residence of a scholar of the Qing Dynasty. 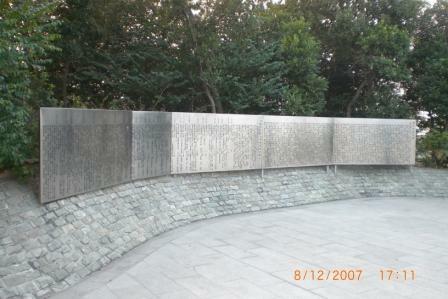 I had never been to this place until going back to Hong Kong in 2007. Without a tour guide, this place seemed like just a simple old house. But after the explanation of a knowledgeable tour guide, this little old house had many "wow" factors. We were lucky enough that my sister drove us over there. After parking the car, we followed the signs and took a few minutes walk before arriving at this place. We went in and walked around for about 10 minutes and were ready to leave. Just before stepping out of the house, a very enthusiastic tour guide approached us and gave us a tour. We ended up spending at least another 30 minutes enjoying the tour. I am trying to recall what I learned from this knowledgeable man to share it with you. "Tai Fu", one could only have this title if he achieved the highest grade in the Imperial Chinese civil service examinations. 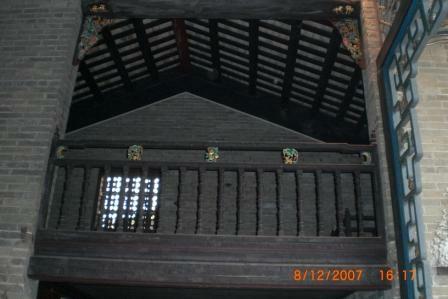 The residence was built in 1865 by a senior Man clan member whom was bestowed the title of Tai Fu by the Qing Emperor. "Tai", at the end of the name, means residence which was only used by the rich and/or privileged class in the past. 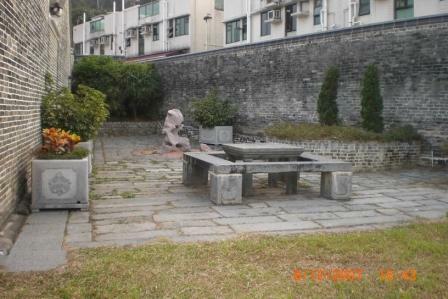 When you first step into the Hong Kong Tai Fu Tai Museum, there is a big open area. On your left hand side, you still can see the wharf. On your right, there is a little building that was used for raising animals back then. 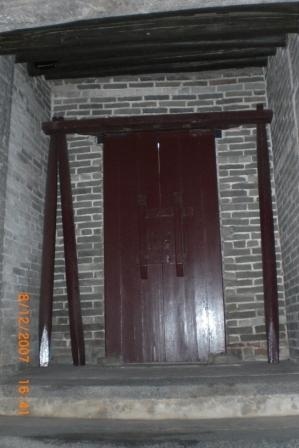 Going into the house, there is a tall threshold at the doorway. You must raise your feet high to get in or you will trip. That piece of wood represents the official ranking in the past. 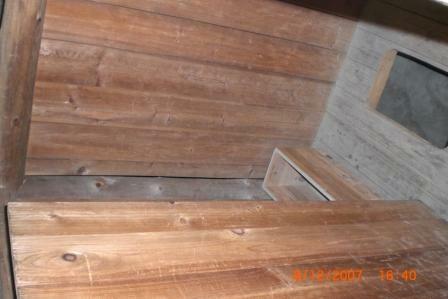 The higher the wood, the higher the position of the owner of the residence in the government. Don't go too fast. As soon as you stepped in, raise your head. 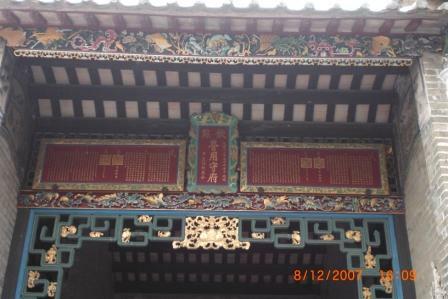 You will see a plaque written in Chinese and Manchu with the seal stamp of the emperor bestowing the title of "Tai Fu" to the scholar. 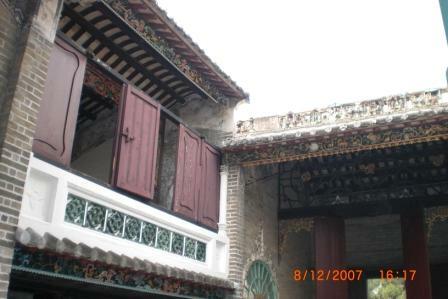 Then, you see another open area which is called the courtyard. This is the place to collect all the rain water. 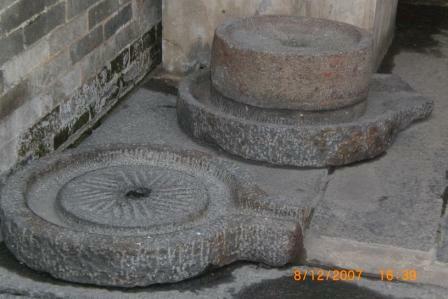 In the Chinese culture, water represents "wealth". So, when it rains, the Chinese want to collect as much water as they could in their property. 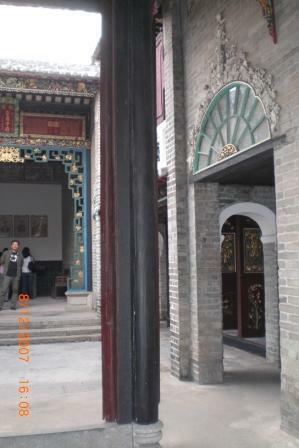 On both sides of the courtyard, there are doorways going into rooms. 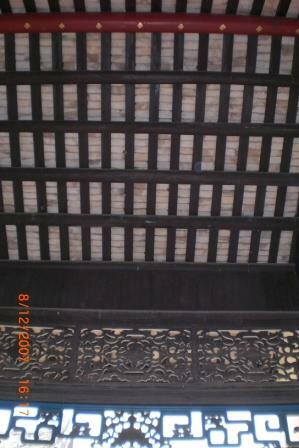 After that it is the living room and the place for worshiping the ancestors. Visitors are not allowed to go upstairs. While we were there, we couldn't find any staircase. We believed that it is somewhere which is not open for the public. At the entrance, turn right. You are heading towards the back door. 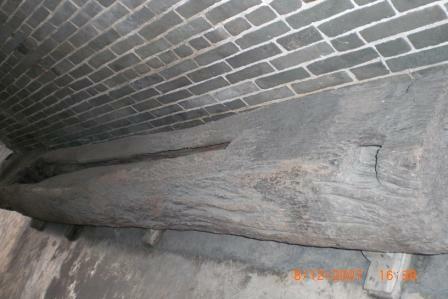 The door locks were two heavy rods sitting into the ground. 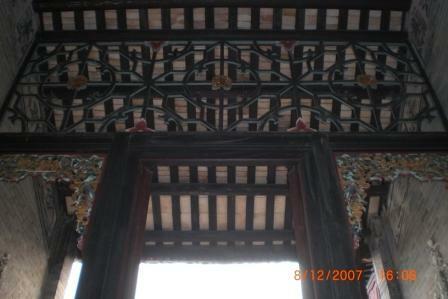 Raise your head again, you will see some decor on the outer walls of the house. 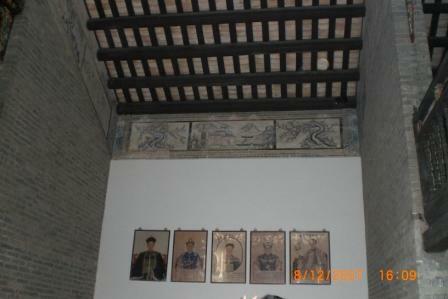 They are animals, such as bats representing luck and some Chinese beasts to protect the household. There is no dragon because only the emperor could use that. Before heading towards the kitchen area, there is an entrance next to the back door. That is the bathroom. We didn't take many pictures inside. 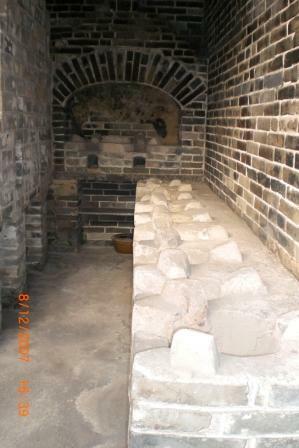 But you may be interested to check out how the bathrooms looked like back then. Don't worry. They are not working. It's all clean. 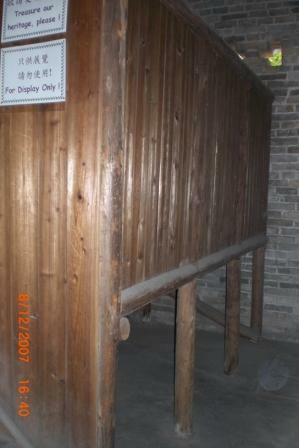 Next to the kitchen entrance, there is a big "casket-liked" box. It was used to make peanut oil. This house was once used as a peanut oil factory. To make peanut oil, it was filled with peanuts and slide the tool, which was next to box, at one end pushing the peanuts to the other end. 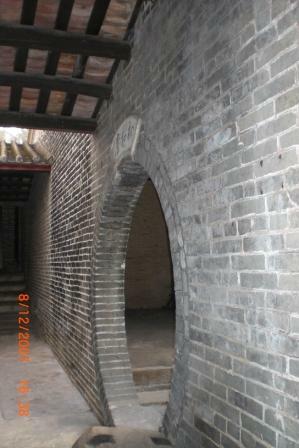 Going through a round arch, it is called the "moon door". It represents fullness, togetherness and perfection. 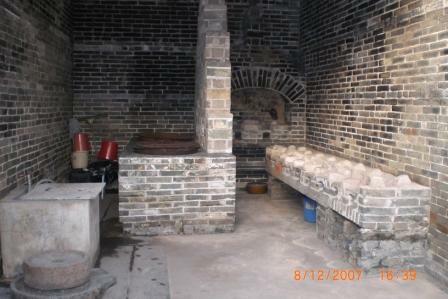 It is the kitchen area. 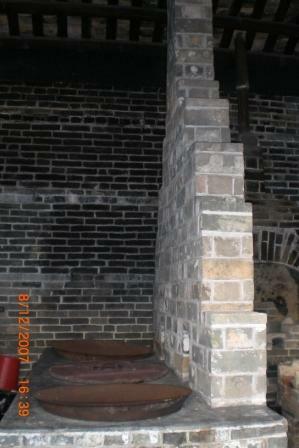 Behind the wall, there are big openings underneath where the coal was put in through there. If you pay attention to the picture below, the wall on the left hand side is the same wall of this picture. 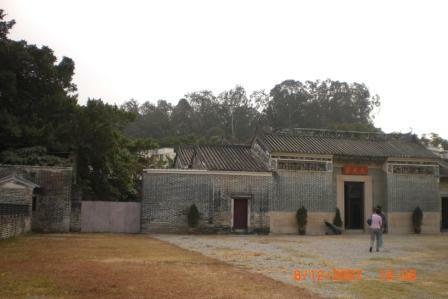 Heading back to the entrance of the Hong Kong Tai Fu Tai Museum, turn left to the master bedroom. Part of the master suite. This part is outdoors. The room itself was empty which was the reason why we didn't take the picture of it. 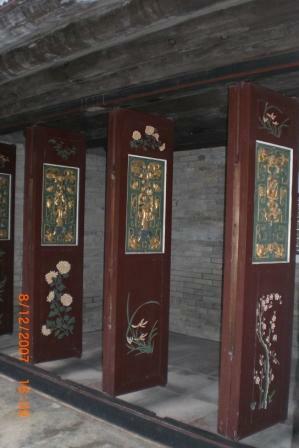 Going out of the house and walk to the backyard, there is garden furniture and Chinese landscaping. Leaving the Hong Kong Tai Fu Tai Museum, you can turn left and keep walking into the loop to check out the set up in the New Territories. 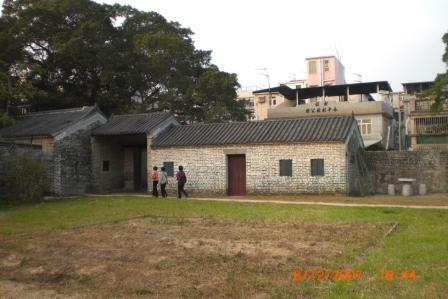 The houses are very different from those on the Hong Kong Island and Kowloon Peninsula. WARNING: When you are walking around in the area, beware of the stray dogs. The villagers are very different from the people in the cities, too. Please be respectful. 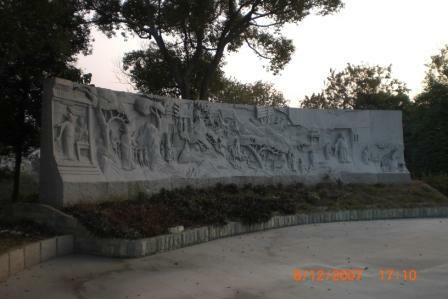 Since the Hong Kong Tai Fu Tai Museum was built by the Man's clan, you may come across Man Tin Cheung (1236-1282) Memorial Park. 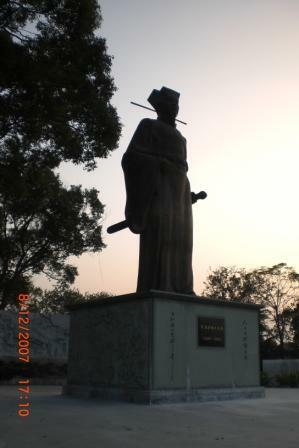 He was one of the greatest patriots, poets and last prime minister of the Sung dynasty. He was executed by the Mongols after a 3-year imprisonment. A setback of visiting Hong Kong Tai Fu Tai Museum is that if you are not a Cantonese or Mandarin speaker, you need a translator. The tour guide doesn't speak in English. I was the translator for Perry when we visited there. 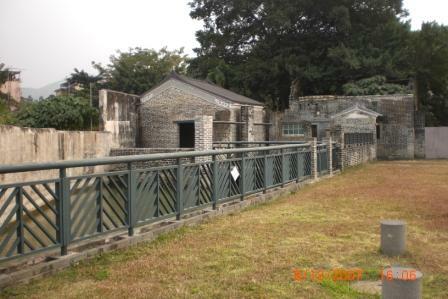 Direction: MTR Sheung Shui Station and take bus 76K (opposite the station), and get off at San Tin near the post office. 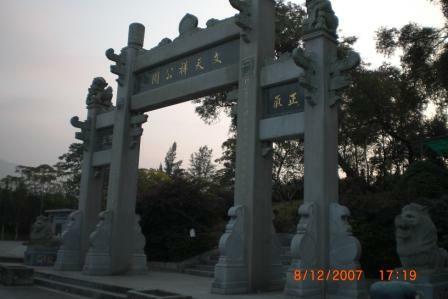 Then, follow the signs and walk for 5-10 mins to Hong Kong Tai Fu Tai Museum.